(Newser) – Starbucks has told employees to let anyone use the restroom, even if they haven't bought anything, as it reviews its policies and tries to restore its reputation after the arrest of two black men at a coffee shop in Philadelphia, per the AP. "We don't want to become a public bathroom," said Starbucks Chairman Howard Schultz, "but we're going to make the right decision a hundred percent of the time and give people the key." The coffee chain said it wants all customers coming in "to feel welcome" and is conducting a three-month review of its guidelines. The arrests in Philadelphia were a major embarrassment for Starbucks, which has long projected itself as a socially conscious company and has promoted its stores as a place for people to gather outside of their homes and offices. 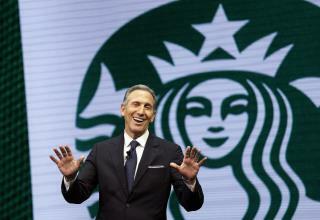 Schultz said Starbucks had maintained a "loose policy" on bathroom access, though decisions were ultimately left up to store managers on whether someone could use them. At the Philadelphia store, it was policy to ask people who hadn't bought anything to leave. That was the case at the store on April 12. The two men, who were asked to leave the store after one was denied the bathroom key, sat down to await a business meeting they had scheduled. They were arrested minutes later by police, an incident captured by people using cell phones. It went viral, leading to protests. The company plans to close more than 8,000 of its US stores on the afternoon of May 29 for racial-bias training for its employees. So they are going to appease the racist blacks thugs? Two idiots who refused to leave got rightfully arrested. Hookers need a place to take people to.